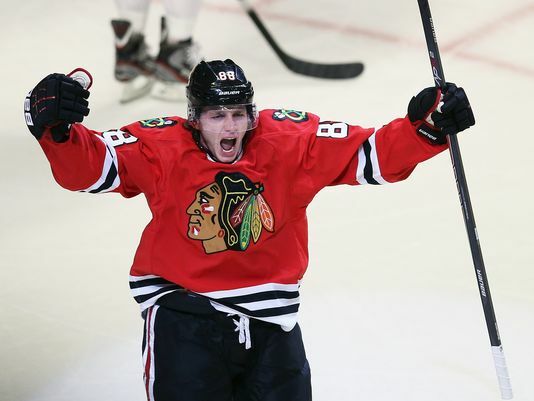 It didn’t take long for Patrick Kane to extend his point streak to 26 games in the Chicago Blackhawks’ 4-0 win against the Vancouver Canucks at United Center on Sunday. Kane kept his streak going with a secondary assist on a power-play goal by Duncan Keith that made it 1-0 Chicago at 11:51 of the first period. 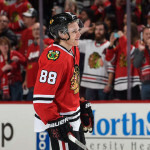 Patrick “ShowTime” Kane is crafting an epic masterpiece worthy of praise from everybody around the hockey world. Even his harshest critics have to admire the difficulty of the task. A 26-game point-scoring streak, at a time in which goal-scoring is dramatically down, is awfully impressive. Kane’s streak is the longest in the NHL since Mats Sundin went 30 games for the Quebec Nordiques in 1992-93. The Blackhawks have a 15-7-4 record during Kane’s streak. Kane passed Sidney Crosby of the Pittsburgh Penguins, who had a 25-game streak during the 2010-11 season. 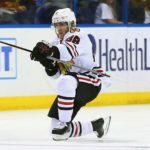 Kane has 16 goals and 24 assists during his streak, which began with an empty-net goal Oct. 17 against the Columbus Blue Jackets, Chicago’s sixth game of the season. 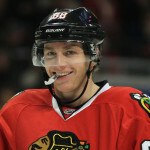 As my loyal readers already know, I am a huge Patrick Kane fan. To be honest, I did not think he could possibly impress me any more than he already had. Then, Kane puts together the longest point-scoring streak of any active NHL player, and I’m impressed all over again. For those of you wondering… Gretzky holds the NHL record with a 51-game point streak for the Edmonton Oilers that started the 1983-84 season. Gretzky had 61 goals and 92 assists during his streak.